Diesel Porsche Panamera here in August | What Car? 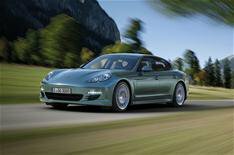 Porsche will add a diesel engine option to its Panamera range from August. Priced from 62,134, the 247bhp diesel car averages 43.5mph, accelerates from 0-62mph in 6.8 seconds and goes on to a top speed of 150mph. Low-rolling-resistance tyres are available as an option, and these improve average economy to 44.8mpg. With standard tyres, emissions of 172g/km mean the car is in the 27% company car tax band. The low-rolling-resistance tyres drop emissions to 167g/km and put the Panamera in the 26% band. With an 80-litre tank the 3.0-litre V6 Panamera Diesel has a theoretical range of up to 745 miles, which is enough fuel for a non-stop trip from Lands End to Loch Ness.